The final mercenary unlatched his vest after ensuring Kristof’s hands and feet were bound with zip ties. He rose and turned to the tree line as Anne and the rest of Globe’s team ran out of the woods toward the burning cabin. As his combat vest fell to the ground, the mercenary withdrew a pistol and started to intercept the newcomers from the forest. “Rescue the subjects from the burning cabin!” Globe yelled to the mercenary. The mercenary jumped through the open cabin door, avoiding the smoking doorframe. He dragged out Peter, abandoning him at the bottom of the steps. He turned to return for the fallen mercenary. The mercenary paused just long enough to slap a pair of metal handcuffs against Peter’s wrists. He bounded up the stairs, but the cabin was now fully engulfed. He staggered back and abandoned his teammate as Globe skidded to a stop at Peter’s prostrate body. “Where’s Joaquin?” Anne shouted as she brought up her Smith and Wesson 460 revolver, the red chrome reflecting the flaming cabin. Globe reacted by producing a TASER and shooting Anne in the chest. Her body convulsed and she fell over dropping the .460 into Kristof’s lap. Kristof staggered to his feet, gripping the .460 with his bound hands. Globe dropped to the ground and the mercenary froze. The heavy revolver felt light in Kristof’s hand even with the near miss he suffered at the hands of one of the mercenaries. A red flower blossoms from the mercenary’s chest. Fragments of bone and canvas erupt as the mercenary falls face first on the ground, the look of terror permanently affixed to his face. Kristof felt the hand cannon twinge his shoulder. The seared bullet wound on his shoulder broke open spilling thick blood onto his torn sleeve. Kristof swung the revolver towards Globe. “Stop!” Anne coughs as she regains control of her throat. “We’ve been their betters for centuries,” Anne pleaded. “So they’re your pets?” Kristof loaded as much scorn into the last word as he was capable of. “Silence!” shouted Kristof. “They’re ants scurrying about their little ant farm. Sometimes,” he turned at pointed the .460 at the shocked R-C-M-P liaison. “Sometimes you have to kick over the farm.” He pulled the trigger and the liaison toppled over. He winced at the additional pain in his shoulder. He raised the .460 toward Globe, but before he could squeeze the trigger, a shot echoed from overhead. Something impacted Kristof’s chest and he staggered backward. His feet, still bound, didn’t allow him to regain his balance. His arms still bound were unable to flail and he fell, striking his head on a rock. The helicopter hovered over the clearing. A radio was dropped from the open hatch. Globe picked it up and spoke into it. The helicopter silently pulled up and a flock of birds flew out of nearby tree, away from the bladeless machine. “I’ll never work for you again!” she hissed. Bree ran past Anne into the arms of a now kneeling Globe. Bree’s brow furrowed. “Bad birds,” she replied. She looked up to the escaping flock and the birds started falling two and three at a time. Anne gasped at the sight. One of the birds fell at her feet. It looked like a raven of some sort. The wings were outstretched as if in mid flight. The eyes were gone and she couldn’t tell against the dark plumage, but there appeared to be sticky blood crusting over where the eyes had been. Globe hugged a crying Bree, patting her on the back. “Option two,” he mouthed as Bree broke free from the hug. Bree looked at Anne. “Does she like kitties?” she asked, not looking away from Anne. Anne looked around. Soldiers were injecting Peter and Kristof with a syringe. They rolled the unconscious bodies into canvas sheets and attached them to zip lines dangling from the helicopter. Anne stood mute. This entry was posted on Wednesday, February 25th, 2015 at 05:00	and tagged with #bekindrewrite, 16Sunsets and posted in fiction. You can follow any responses to this entry through the RSS 2.0 feed. Tense! Poor Anne, caught in the middle, not ready to kill for either side, not ready to accept that that’s what it’s probably going to take. I felt for her. Thanks, Steph! 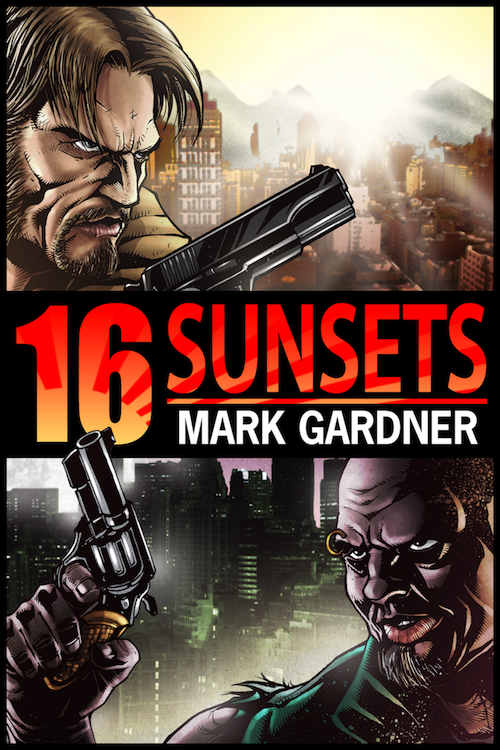 Now that 16Sunsets is done, I hope to get back no non-serial flash fiction.